This deck is no joke! Sitting in our Greensboro hotel room following the Regionals, fellow writer Isaiah Williams and I began to brew up a Zapdos / Lycanroc-GX deck. The concept began all the way back at Oceania Internationals in the hands of Karl Peters. He finished fourteenth and we haven’t seen all too much of the deck since. Recently, Williams took the deck to a League Cup and won it undefeated. I attempted to do the same the next day in one of my own, but I lost to a Zoroark-GX deck in Top 8. You might be wondering why this deck could possibly good if I happened to lose to what should be a favorable matchup. I think I just had some poor luck and I’m excited to keep testing this concept out in the coming days before Denver Regionals and beyond. In addition, a Lucario-GX variant of this sort of a Zapdos deck has popped up as well. Could that just be better than Lycanroc-GX? For a single Energy, Aura Strike can deal 120 damage, enough to one-shot an Alolan Muk, one of Zapdos deck’s most fearsome enemies. Some things have been ramped up, others have been dropped down or cut altogether. I’m confident in this list and would be playing this deck as of now if Denver were this instant. Let me explain the list! Still the best starter in the deck, I still wholeheartedly believe that four is the way to go. Having the four count boosts your early game and is amazingly good in any Zapdos deck to thin things out and ensure you get the cards you need. While in many matchups you don’t want to put two down at a time, be it out of fear of Sky-Scorching Light GX or just easy Knock Outs, there’s still a lot to like about the early consistency of having four. You’ll surely appreciate it in other matchups where getting a fast start is necessary to win. 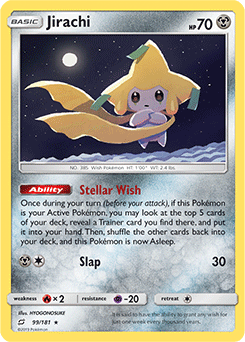 While Alolan Muk can body your deck, an early Jirachi can start can tie into a Guzma play to eliminate an Alolan Grimer or Ditto Prism Star before it can evolve to avoid the problem altogether. The only times you dislike four Jirachi are in matchups where it’s turned off or in a position to be punished, in which case you can simply choose not to bench them. The heart and soul of this deck. While I don’t think four is necessary — I can elaborate a little more on that in a bit — you still want a higher count. In many matchups you’re going to want a more diverse Bench with the likes of Buzzwole, Rockruff, etc. Having many Zapdos on the Bench isn’t necessarily a must, and with two Rescue Stretcher in the deck you can afford to cut some corners on a full count. Playing one less also decreases your chances of starting with it and improves your odds of opening Jirachi. Tapu Thunder GX is still an amazing attack and Sky-High Claws is a solid attack for a unique change of pace attack. With Electropower and Choice Band the sky’s the limit for this guy. I would still highly recommend playing Tapu Koko-GX even though this list does introduce another GX attack. Aero Trail has its own unique use to switch your Pokemon around and get better value out of the Energy you have in play. There are so many positives to this card that having the option is more than worth it. Adding some unique flavor to the deck, the Lycanroc-GX line is special. 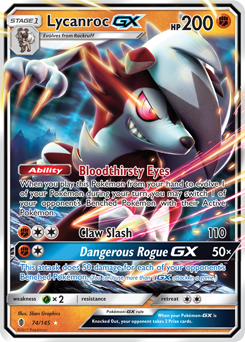 Bloodthirsty Eyes is always a strong Ability and ties in well with the speediness of Zapdos, handpicking what Pokemon you want to Knock Out. The obvious benefit of the card’s addition is the Dangerous Rogue GX option to blow back opposing Zoroark-GX and even eliminate Alolan Muk. It gives the deck a nice one-shot potential card and while reliant on your opponent a bit, it’s hard to play around. Zoroark-GX decks must fill their Bench to one-shot Zapdos without damage modifiers so having Lycanroc-GX to punish a full Bench is great. Even using Claw Slash is realistic since you can power Lycanroc-GX up with Dance of the Ancients. Thunder Mountain Prism Star supplements this card because on the turn you play the Stadium you can attach to a Rockruff or the Lycanroc-GX itself if it’s out and get it ready to go while still being able to use Thunderous Assault. There’s so many benefits to this card that I can’t even think to list, but I’m positive in saying it’s worth having it in the deck. I like the split of Rockruff so you can Corner an unsuspecting opponent — I decked someone out recently at a League Cup with it!